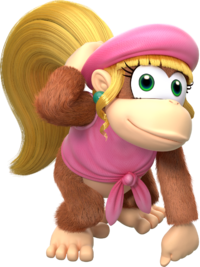 Official artwork of Dixie Kong from Donkey Kong Country: Tropical Freeze. Dixie Kong (ディクシーコング, Dixie Kong) is Diddy Kong's girlfriend and a major character from the Donkey Kong series. Dixie Kong from Donkey Kong Country 2: Diddy's Kong Quest. Used as basic for her trophy in Melee. Note the knee-pads she used to wear and lack of earrings. Dixie Kong originates as Diddy Kong's girlfriend and sidekick in Donkey Kong Country 2: Diddy's Kong Quest. 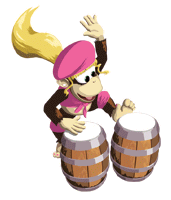 She went on to appear in the starring role in Donkey Kong Country 3: Dixie Kong's Double Trouble!. Since then, she has been one of the main recurring characters of the Donkey Kong franchise. Dixie Kong appears as a trophy. Dixie Kong trophy in Melee. More than just Diddy Kong’s girlfriend, Dixie Kong is also a fearless adventurer and a reliable team player. She earned her wings helping Diddy rescue Donkey Kong from the clutches of King K. Rool. Dixie's amazingly quick and nimble, and she's even able to twirl her ponytail in order to float slowly through the air. Dixie was a scrapped design for a playable character, as evidenced by leftover references for "dixie". According to Sakurai, Dixie Kong was intended to be teamed with Diddy Kong, where the two could be tagged out for each other in the midst of battle, similar to how they played in Donkey Kong Country 2: Diddy's Kong Quest; the idea, however, was cut after he ran into technical issues with implementation of the idea, and only Diddy Kong appeared as a solo fighter in Brawl. In the final game, Dixie Kong appears as a trophy, referenced as a color scheme for Diddy Kong, and a single sticker of her and the DK Bongo drums. Dixie Kong trophy in Brawl. Dixie Kong reappears as a trophy in both versions, and referenced as a color scheme for Diddy Kong. Additionally, in Super Smash Bros. for Wii U, Dixie Kong appears as a red Smash Tour item, which gives the user an extra double jump for the duration of a battle. Dixie Kong trophy in Super Smash Bros. for Wii U.
Dixie Kong trophy in Super Smash Bros. for Nintendo 3DS. Diddy Kong's girlfriend. She loves to adventure with him. Her ponytail isn't just for show—she can use it to swim faster, soar in the sky, and even lift barrels! With hair that does all that, you can bet she takes good care of it! Dixie Kong is all about style and substance. Just look at her ponytail. It's not just a fashion statement - she can spin it to fly up into the air, swim against strong currents, and even throw barrels with it, no problem! No wonder Diddy Kong likes her! 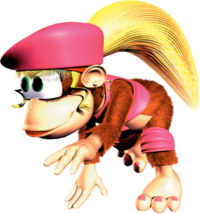 Dixie appears as two Spirits (one of herself and one of her and Kiddy Kong on a raft) and was referenced as one of Diddy’s color schemes again, and her hat, hair, and ponytail appear as Mii Fighter headgear. This page was last edited on February 28, 2019, at 00:51.